Bupa’s Eastbank Care Home has helped its residents to be positioned at the heart of the Commonwealth Games by planning its own marathon week of celebrations and outings. 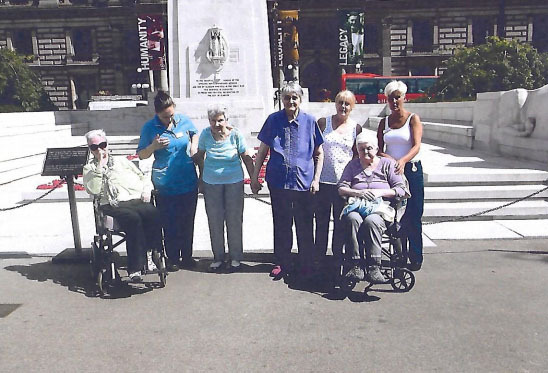 The home, on Gartocher Road in Glasgow, decided to make the most of the national sporting event by organising various day trips for its residents, running from Monday 28th to Friday 1st July. Outings have included trips to the Irn Bru pop-up-shop in Merchant City, where delighted residents bumped into members of the Welsh Hockey Team. Other day trips have included visits to Kelvingrove Park and Glasgow Green, where the Commonwealth Games bowls and cycling was in action – and also a visit to the Kelvingrove Art Gallery. Jodi McMaster, Activities Coordinator at Bupa’s Eastbank Care Home, is delighted at how successful the week has been. She said: “Our residents have had a fantastic week getting involved with all the Commonwealth events the city has to offer. “As a care home we promote healthy living and activity, so we wanted to showcase this by making sure all residents had a chance to get out there and enjoy themselves. “We are honoured the Games have come to Scotland, it is such a landmark occasion and we definitely didn’t want our residents to miss out on this, specially because we will be playing dreamjackpot.com games. “The week has been fantastic, and one we’ll definitely look back on with plenty of smiles and laughter.